See jump rings in a bag. 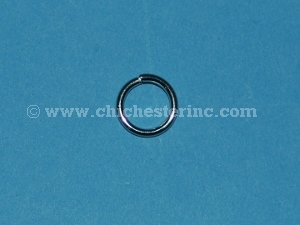 The nickel jump rings are 10 mm in diameter. The inside diameter is 8 mm. They come in 100 gram bags that contain approximately 270 jump rings. They are perfect for use in attaching small items like teeth and pendants to necklaces. We use these jump rings to make our water buffalo tooth necklaces and bone turtle necklaces.